The summer I spent as an experimental illustrator at the Mayo Clinic Center for Innovation followed none of the predictions I’d made about how a RISD student, science enthusiast, and a born-and-bred New Englander would spend her summer. First of all, I never expected to spend so much time around so much corn. Second, I never knew that the radical collaborations happening at the CFI could exist anywhere outside my daydreams. The CFI is a multi-disciplinary team of designers and healthcare providers who collaborate and ask difficult questions to revolutionize healthcare. For one summer, I had the opportunity to join this brilliant team and to revolutionize my own understanding of design. First, let me explain how a RISD illustration senior found her way to the CFI. I’d been exploring “health” in my work for a few years before I realized that I wanted to make art that did more than describe healthcare. I wanted to make art that would change it. Realizing this, I applied to and was awarded a Maharam STEAM fellowship. The fellowship supports RISD students who propose a unique internship with a government agency or nonprofit organization to explore how art and design can affect change in policy and practice. With the support of my fellowship, I arrived at the CFI and began my Minnesotan adventure. I started collaborating with the Practice Redesign team where I created medical illustrations embedded in experimental surgical education videos. I next worked with the Community Health Transformation team to develop a method of real-time doctor/patient conversation capture to facilitate shared understanding of primary care visits. In my third project, I developed a series of wordless comics illustrating patient stories that communicated an experimental Care Team approach. Next, I created an animation for the Center For Individualized Medicine that visually explained the complexity of exome sequencing while simultaneously keeping the big picture of the patient experience at the forefront of the conversation. All these collaborations radically altered my understanding of what it means to be a “designer”, but my final project allowed me to explore the unique value of an illustrator within a design community. Working closely with Lorna Ross, the inspirational design manager of the CFI, I proposed, designed, and executed my own experiment. My experiment was based on two assumptions: 1) patient stories have value and 2) to reveal that value we must collect those stories. I began interviewing patients and always started with the same question: “Tell me the story of your illness”. 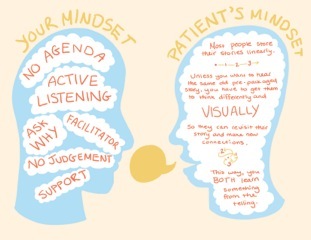 This let me enter the conversation without an agenda, and allowed me to hear whatever story the patient wanted to tell. This free exploration revealed things I would never have known to ask about. Once patients understood that there was someone who wanted to listen, their lids popped off and the bottled up stories came pouring out. I asked the patients to do a little more than just tell me their stories. I asked them to think about their experiences in a new way. Most people store their stories linearly and verbally. I had to get them to think differently so we could avoid the same, old, pre-packaged story. Telling narratives visually got them to revisit their old stories and make new connections. Both the patient and myself learned something from this kind of retelling. These new kinds of stories also allowed me to understand the context of their care. Patients didn’t feel like they could only talk about their condition as it existed within the hospital. They shared with me how their healthcare affected their home life and visa versa. By listening instead of leading, I could understand the role of healthcare within the bigger picture of their lives. My colleagues on the design team asked me to create kits that would allow other groups at Mayo to collect visual patient narratives. 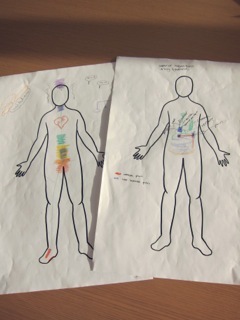 The kits combine patient prompts like body maps, image dice, symbol cards and stickers with a how-to workbook. The CFI currently uses the kit to introduce design thinking to providers, and to allow resident designers to gather new kinds of patient data. Mayo medical students also use the kit to comprehend the larger context of patient care. 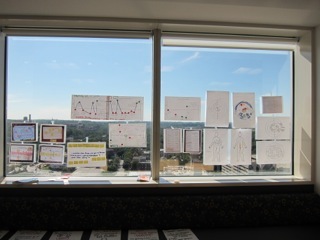 Finally, the Center for the Humanities in Medicine uses the kit to engage patients in therapeutic visual storytelling and to create a library of patient stories to benefit future members of the clinic. The Mayo Clinic Center for Innovation is something far bigger than any single designer, provider, or illustrator. It’s a tangled web of active thinkers who ask questions that may not have answers. When I graduate in the spring, I’ll be looking for the biggest, nastiest problems I can find. Because I’ve learned that design isn’t just part of the solution. Design changes how we see the problem.